We have written an article concerning How to Authenticate Apps for posting in a previous article. However, many are having the issues of getting access token when they click the ‘Get App Authenticate Link‘ button for some Apps. This article provides you an alternative method to get access tokens. When you Goto Settings > Facebook Apps. Click on the Authenticate button of the App you want to authenticate. Click the Authenticate App button and follow the instructions as explained in this article. After completing the app permission stage, and you click the ‘Get the App Authenticate Link‘. If you get a blank page with a URL like this ‘data:text/html,<html><meta http-equiv=’refresh’ content=’0; url=view-source:https://goo‘ as in the image above, that means you won’t be able to get the access token. Now follow the procedures below to get access token using the alternative method. This method is as simple as the normal method, the only difference is that you need to work with speed this time around. 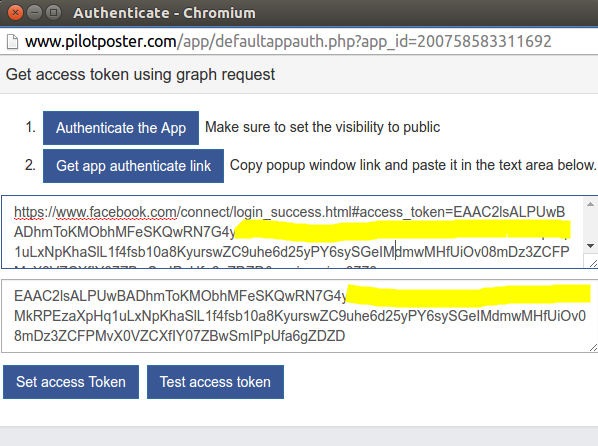 From the Authentication pop up window, highlight and copy the App Source-URL (as shown in the picture below). Open another tab on your browser and paste the link. When you enter the URL in another browser, you need to QUICKLY copy the link that shows up before it redirects (Link shown for just 1 Sec). Yes you have just ONE SECOND to copy the link. 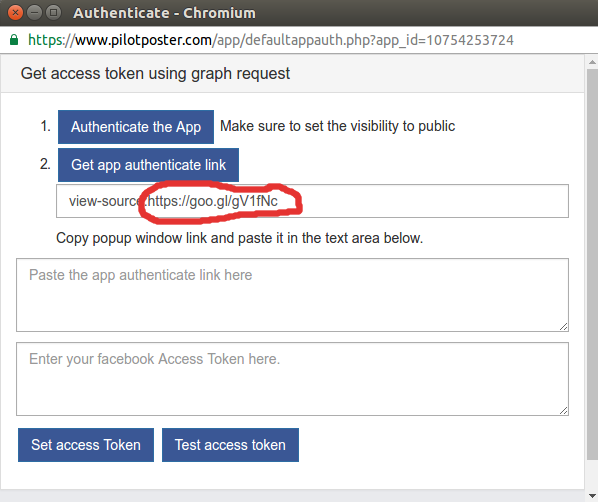 Now paste the LINK in the access token field (as shown below) of the authentication field, and the second will be generated. Click the Test Access Token to ensure your access token is valid. Then Click Set Access Token to complete the authentication process. We hope you are able to fix your Facebook Access Token issue with this. Drop your comments below if you still have any App authentication related issues. Il problema è che quando clicco su add facebook account mi esce una finestra che dice di mettere un token. Ma nel video la finestra contiene un url da copiare. Ecco, a me non esce nessun url. Il nuovo metodo usa Facebook per il metodo iPhone. Guarda il video di seguito come utilizzare questo metodo. In alternativa, è possibile fare clic sull’icona HTC per passare al metodo precedente. I got ” NO FACEBOOK ACCOUNT ARE SELECT ” problem..all apps are same..i try to change to another fb acount..but its doesnt work also. so how to counter it. Hello, kindly send your username to support@pilotposter.com so we can look into your account. Thank you. I have followed the extended instructions (the 1 second copy). It simply does not work. I have tried it in Safari, Chrome and Firefox. If I use the Graph API APP I constantly get ‘Invalid Access Token’ interuptions. Hello, have you gone through our guide on authenticating HTC Sense app ( https://goo.gl/0zmULw )? If you have, please let us know the exact issue you face with the app. You can also send screenshots to support@pilotposter.com. Hello. I appreciate ™Pilotposter but Apps like (Spotify, HTC sense one) can’t be authenticated. I am definitely not logged out as plotposted posted in groups. Error validating access token: session has expired on wednesday, 19-apr-17 14:00:00 pdt. the current time is thursday, 20-apr-17 01:20:09 pdt. I am getting the above error. I have reloaded facebook account also used HTC Sence. Please Authenticate HTC Sense App and set as default. Error validating access token: This may be because the user logged out or may be due to a system error. Hello, to fix the error, you need to re-authenticate your app. Check this article on how to.